This morning we slept in a bit. I thought about making omelets for breakfast but decided instead to make fried eggs. The main reason I had wanted an omelet was so I could fill it with my Cabot pepper jack cheese that I love. As I was cracking my eggs into the pan to fry, I decided that I could still enjoy my pepper jack cheese with fried eggs...I would just make "Jack-Fried Eggs." I diced up the pepper jack cheese and when my eggs were close to being done, I sprinkled the diced cheese on top and covered the pan for a minute or so just until the cheese melted and then pulled it off the heat and let it sit just so the cheese could set up a little bit and not run off when I slid the eggs off onto my plate. It worked wonderfully! While the eggs were set aside, I split and toasted one of my Power Bagels and buttered it with Kerrygold butter. It was like having fruited cinnamon toast...it was SO good! I heated up a couple Applegate chicken maple sausages and "Voila"...I had a super yummy breakfast with almost no effort. I snapped a quick photo for you to see below. Enjoy! P.S. -- For those of you that are Costco members, they have Kerrygold butter on sale this month for $1.50 off per box ($5.49 on sale for a box of 3 bricks). Even though I didn't need any right now, I picked up a couple extra boxes. You can never have too much Kerrygold! I like fried eggs much better than scrambled. 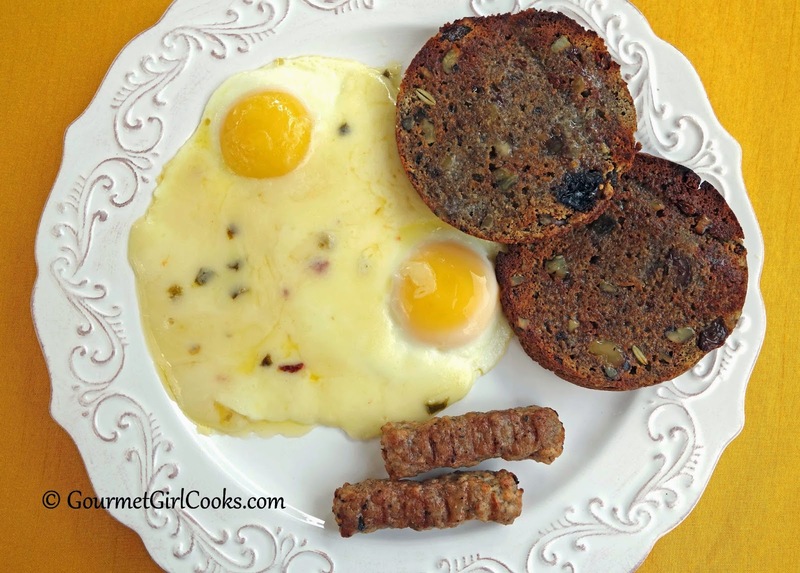 This is a great idea for cheesy eggs that I plan to try...this morning! Those fried eggs with cheese look delicious! I must try your power bagels recipe.